"Julie Orser's photography and video works consistently engage with the mechanics of American cinema, with a particular focus on representations of women in film." "Julie Orser conceives of an inventive architectural installation placed on two high, right-angled windows from pink, yellow, and blue transparent video cases." "The chief reason to visit this show is to see Julie Orser’s 5-minute, 2007 video “Double Bind (Anna Moore),” which will stay with you longer than many two-hour movies. It’s shot on video, but it feels like film, borrowing the motifs of noir crime dramas, the color palette of Douglas Sirk and the symbols and interior psychology of numerous Alfred Hitchcock movies." "Other works in the exhibition cover wide thematic terrain. Julie Orser’s “Double Bind” follows a perfect ‘50s housewife in her perfectly color-coded home – her apron even matches the yellow walls of her kitchen – whose life is a cycle of domestic drudgery. She becomes obsessed with another woman – perhaps her in another reality – who lives in a mysteriously monochrome universe as a femme fatale." "The surprising ways that contemporary video artists deal with narrative is the subject of six videos by four artists in “L.A. 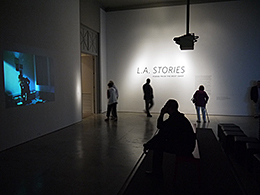 Stories: Narrative Video From the West Coast” at the Norton Museum. The videos haven’t been shown in South Florida before." "Julie Orser’s video pieces in the exhibition, Bottleneck and Occurrence at Lookout Rock, are acutely aware of filmic history and devices, and reference character stereotypes and landscape imagery in old westerns-a typically male, typically violent genre." "You stand in the center of four large screens. Angled to surround you, each screen offers a different perspective of a rocky desert landscape. From a single perspective of rock emerge, one by one, four women dressed in old-west, 19th century-costume: a spirited, blue-clad pioneer, a fierce cowgirl, a menacing female bandit and a sultry and commanding saloon girl. Each takes a stance and stares heavily and coldly at you." "Julie Orser's video Blood Work (2009), for example, extracts quintessential visual and aural elements of horror films. One by one, archetypal props (teddy bears, high heeled shoe, lampshade, purse) are foused with bright red fake blood as familiar horror movie melodies and Foley effects amplify the drama." "And then there’s “Blood Work,” Julie Orser’s delightfully slick send-up of the horror genre. At just three minutes, it’s a gem of an art film, with one crisp sequence following another." "Julie Orser's 'Blood Work' is a send-up of horror film shtick teeming with dripping, splashing and otherwise uncontained blood - well, the irrationally bright red fake stuff. The grisliness flips over into giddy satire in Orser's work, whereas Tamy Ben-Tor's 'Izaak' tells the Old Testament parable in disjointed, puppetry-styled form." "Rarely has the project space at Domestic been as smartly employed as it is for Julie Orser’s photo-and-video exhibition, curated by Kaycee Olsen as part of her Opus Projects and titled “Anna Moore.” The gallery space mimics the interior of a house and gives shape and context to the on-screen performance." "The mysterious name given by Julie Orser (Chicago; lives in Los Angeles) to this new female character seems to come from the dawn of cinema. Anna Moore was the protagonist of Way Down East, a drama with strong hues of D.W. Griffith." "The powerful, romantic, unsettling and unforgettable new multimedia project from Julie Orser inaugurates the Paul Kopeikin Gallery’s second space, introducing the video and film installation programs to be shown there under the Opus Projects rubric. “Anna Moore” is a three-channel video and one-track audio installation with prints of captured videos frames." "Two souls caught in one woman, that of the perfect housewife and that of a femme fatale suggested by the films of the fifties. Both roles are in fact those imposed by the dominant male, and the American artist Julie Orser presents them in video at Changing Role Gallery of Rome." "Born in Chicago in 1974, Julie Orser studied photography and studio art, and currently does something that could easily be mistaken for filmmaking, if it weren't for the fact that modern cinema is the very thing her art most deftly deconstructs. Her videos and photographs are shown in institutions from MoMA and REDCAT to the Royal College of Art, but she also does well on the avant-garde film festival circuit."